Flamenco music and dance originated in the Spanish region of Andalusia but has also now become a firm fixture in North London's cultural calendar. 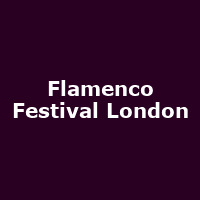 The annual Flamenco Festival London at the Sadler's Wells theatre in Islington features some of the finest artists from across Spain. The Financial Times says: "Aficionados will need no further goading for this event; newcomers will be gripped by the passion and wild movement." And they'd know. The five short runs begin on February 13, closing a fortnight later on February 27, and include dates from Nuevo Ballet Español, Eva Yerbabuena ("This woman is touched by greatness" says The Times), Rafaela Carrasco and Maria Pagés. The last two dates are the closing gala. This year's gala features some of the most important new figures in flamenco: Pastora Galván, a versatile dancer able to navigate easily between classic and modern flamenco; Manuel Liñán, a master of technique who is steeped in tradition and known for his dramatic choreography; the passionate Belén López, who has caused a sensation in flamenco circles in recent years; and Rocío Molina, the fiery dancer who has become "one of the finest soloists in the world today" (New York Times). Prices range from £10 to £38, with tickets on sale now.